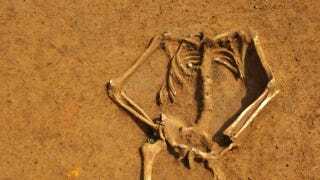 An amateur military historian is claiming that the identity of a 200-year-old skeleton found near the site of the Battle of Waterloo was Friedrich Brandt, a soldier with a curved upper spine who was fighting for the King's German Legion of George III. As Reuters reported back in 2012, the remains — including the musket ball lodged firmly in the chest — were uncovered by construction workers as they were clearing an area in preparation for the Battle of Waterloo's bicentennial commemorations. A mechanical digger smashed into the skeleton's skull and immediately alerted the attending archaeologist, Dominique Bosquet, who quickly shouted for the workers to stop. The discovery of a body near a battlefield where some 30,000 soldiers perished may not seem too out of the ordinary, but Bosquet says the find is exceptional. "No other complete skeleton has been retrieved [from Waterloo] in 200 years," he told The Sunday Times. After the battle, which transpired on June 18, 1815, the British made sure to take home their war dead, while French bodies were looted and thrown into mass graves. It's also known that the pulverized bones of soldiers and horses were sold as soil fertilizer, adding to the rarity of the discovery. The identity of the fallen soldier — aside from the initials FB — had previously been a mystery, but now, three years later, military historian Gareth Glover says he's figured it out. As The Independent reports, "There were only three German soldiers with those initials, all from Hanover, fighting for Wellington to liberate their country which had been invaded by Napolean in 1803. They were given barracks in Bexhill, East Sussex, by George III, who was also Governor of Hanover." One German soldier could be easily discounted because he fought on a different part of the battlefield. The other received a payment after the war, so that ruled him out. That left only one Friedrich Brandt, age 23.